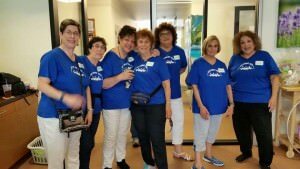 Although the fundraising mission of NA’AMAT is focused on supporting programs for women, children and families in Israel, the organization has a long history of assisting local service organizations through volunteer efforts. “The work of LA Family Housing is similar to the programs we support in Israel,” Peters said. San Fernando Valley Council members regularly collect food, clothing and other goods for the group. The Day Street Apartments are part of LA Family Housing’s country-wide effort to assist the homeless. The two-story, garden-style complex includes a computer lab and courtyard with planter boxes and a dog run. All units are fully furnished. Tenants pay one-third of their monthly income as rent for their units. The San Fernando Valley Council of NA’AMAT USA is located at 16161 Ventura Blvd. #101, Encino, CA 91436.